Jesse stood along a barbed wire fence, searching the distant mountains with his binoculars. Next to him was a locked gate with an ominous sign: DANGER USAF GUNNERY RANGE DO NOT ENTER. It repeated the warning in Spanish as well. 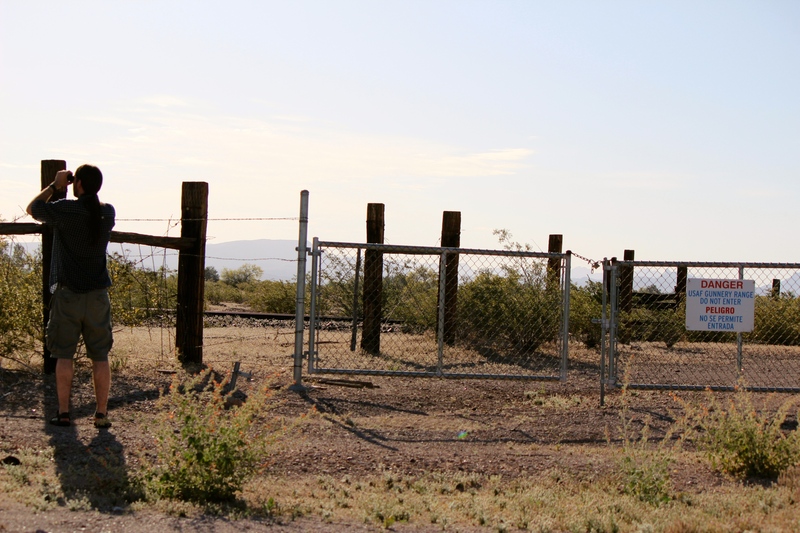 The land beyond the fence was the Barry M. Goldwater Air Force Range, where pilots of F-15s, F-16s, A/OA-10s, F/A-18s, and AV-8Bs were trained in aerial gunnery, tactical maneuvering, LASER use, and more. Yes, the Barry M. Goldwater Air Force Range sounded like a dangerous place to visit. Still, we considered it. We’d planned for me to get the permit from the Gila Bend Air Force Auxiliary, and for Jesse to wait in the town of Gila Bend with Laurel; while I didn’t particularly mind venomous reptiles and the chance for permanent disfiguring injury, the range didn’t seem like a great place to take a toddler. 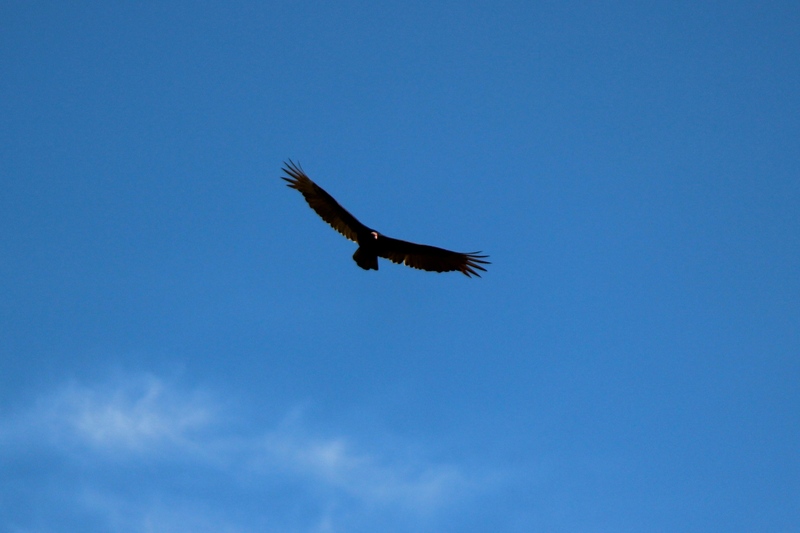 But I wanted to find “Jennie” the turkey vulture, and GPS coordinates sent to me by Hawk Mountain’s David Barber revealed that she’d been roosting in the range’s Sand Tank Mountains for several weeks, not too far from the range’s border with the Sonoran Desert Natural Monument. Unfortunately, my hike in the desert wasn’t meant to be. Jennie’s roost was in the middle of the “East Tactical Range,” which was closed to public use due to active training in the area. Could I have hopped the barbed wire fence and made a run for it? Perhaps, but Jennie’s roost was several miles from the road, and considering that I was four-months pregnant, I wouldn’t be able to run as fast as I used to. And I could imagine the headlines: “Military Police Arrest Pregnant Mother for Trespassing on Active Gunnery Range.” I would have to be satisfied searching for Jennie after she left the roost for the day. Data from her satellite transmitter said that she foraged in many areas around the town of Gila Bend; we’d eat some breakfast and look for her there. After cinnamon rolls and coffee (and after seeing two fighter jets screaming overhead), we headed for Gila Bend High School to look for the location where Keith Bildstein spotted Jennie back in January. It didn’t take us long to locate a single turkey vulture roosting in a large tree (we think eucalyptus, again) in the city park that bordered the school’s athletic fields. This had to be the same tree where Keith had seen the forty roosting vultures, including Jennie. We scrutinized the bird through our binoculars, and the bird seemed to be scrutinizing us, too. To our disappointment, it wasn’t wearing a satellite backpack. But it afforded me good views of a member of the aura subspecies, something I’d lacked to this point. The vulture’s face seemed to have fewer warty protuberances than my local septentrionalis birds; the red of its head looked brighter, and the bird’s overall appearance was sleeker, cleaner, less ruffled and “hunchy” than the birds at home. Satisfied with our long looks at the roosting vulture, Jesse and I turned Laurel loose to play in the park. She investigated the sprinklers that kept the grass green before finally climbing onto a swing—a real, big-kid swing, not the kind with baby seats. Jesse and I took turns pushing her while she giggled. Our friend the vulture seemed to be keeping an eye on us. Beyond the fence, the school’s grounds crew mowed the grass and raked the baseball diamond’s infield. A Say’s phoebe hawked insects along the fence line, and white-winged doves cooed Too soon to tell! Too soon to tell! Finally, the roosting turkey vulture departed the tree and was immediately joined by a second vulture. We didn’t see where this second vulture had come from; could it be Jennie? We watched through our binoculars, but didn’t see anything resembling a satellite backpack. The vultures floated further away—and suddenly there were three more. The five birds kettled together for a minute or two, and then all moved off, out of sight. If one of these birds wasn’t Jennie, certainly they could’ve been birds from the same roost. Jesse and I loaded Laurel in our rental car and took off after the vultures. We passed agricultural fields and stucco homes; during our drive we spotted a few more single soaring vultures, although it was difficult to tell if any were wearing transmitters. Finally, Laurel fell asleep, and we headed north on route 85 towards Phoenix, saying good-bye to Gila Bend and to all the potential Jennies. Keith and the team from Hawk Mountain plan to place transmitters on additional aura turkey vultures later this spring—perhaps they will have better luck locating this elusive bird! 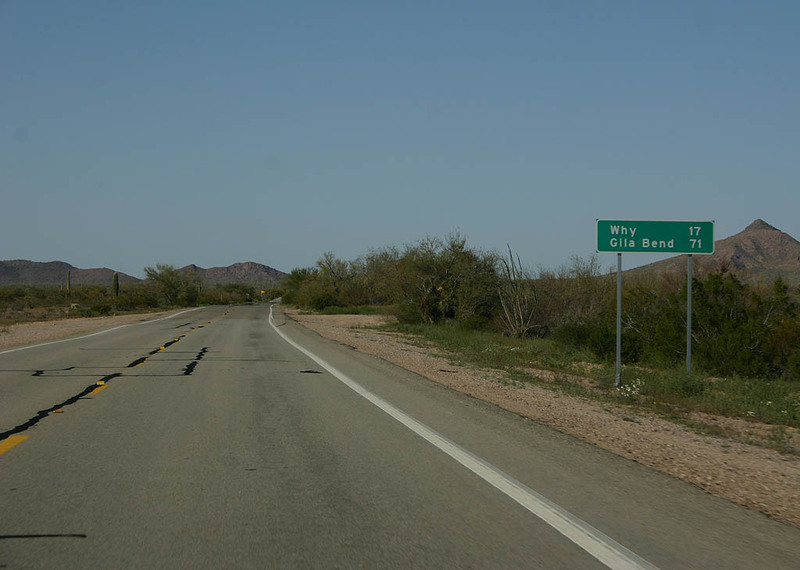 Gila Bend, Arizona, seems like a quiet town—at least, it was quiet on the morning of Monday, March 24, when my husband Jesse and I and our nineteen-month-old daughter, Laurel, made the hour-and-a-half drive southwest from our hotel in Carefree. A few days earlier we’d left snowy West Virginia behind us, flew from Pittsburgh to Phoenix, rented a car, and set out on our version of a family vacation: a family vacation with vultures. I’m currently working on a book about the gorgeous, graceful, vitally important though woefully under-appreciated turkey vulture. I had two research goals for our trip: to attend the “Welcome Back Buzzards” celebration at Boyce Thompson Arboretum State Park near the town of Superior, about an hour southeast of Phoenix, and to locate “Jennie” near Gila Bend. 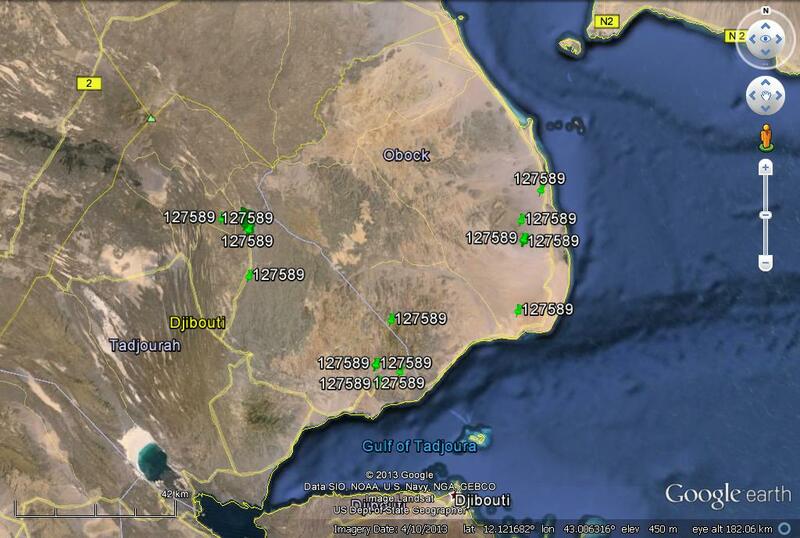 “Jennie” is one of the vultures wearing a Hawk Mountain Sanctuary satellite transmitter (see Dr. Keith Bildstein’s previous “Sonoran Desert Odyssey” and “Desert Solitaire Revisited” posts). So far, most of my turkey vulture experiences and observations had been with the eastern U.S.’s Cathartes aura septentrionalis subspecies, and I was looking forward to getting to know these southwestern birds, members of the subspecies Cathartes aura aura. 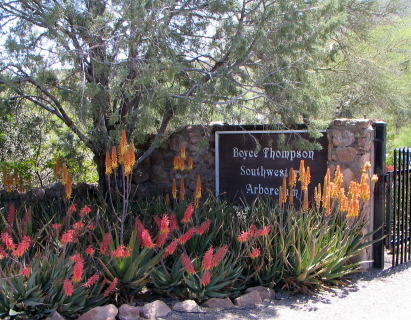 Boyce Thompson Arboretum State Park has been celebrating the return of the “buzzards” for more than twenty years. The population of turkey vultures that spends time in the park departs in the fall and returns, very reliably, in mid-March. Traditional wisdom is that the vultures of the aura subspecies migrate to the tropics and return to Arizona and parts of New Mexico and Texas to breed in the spring; for the park’s vultures, at least, this belief seems to ring true. Or at least the birds leave the park and go somewhere in the fall. Hawk Mountain’s important migration research is working to answer the question of just where aura subspecies vultures go. We arrived at the park just before 7 am on Saturday, March 22. The sun hadn’t quite risen all the way, and the air was chilly. We bundled Laurel in her hooded fleece jacket and headed into the park, following the stream of folks wearing binoculars and clutching coffee cups. The park’s meticulously landscaped trails wind through a Sonoran Exhibit, Demonstration Garden, Chihuahuan Exhibit, Cactus and Succulent Garden, and more. As we passed through the Eucalyptus Forest, I had the feeling I was being watched; I tipped back my head and saw that I was right. 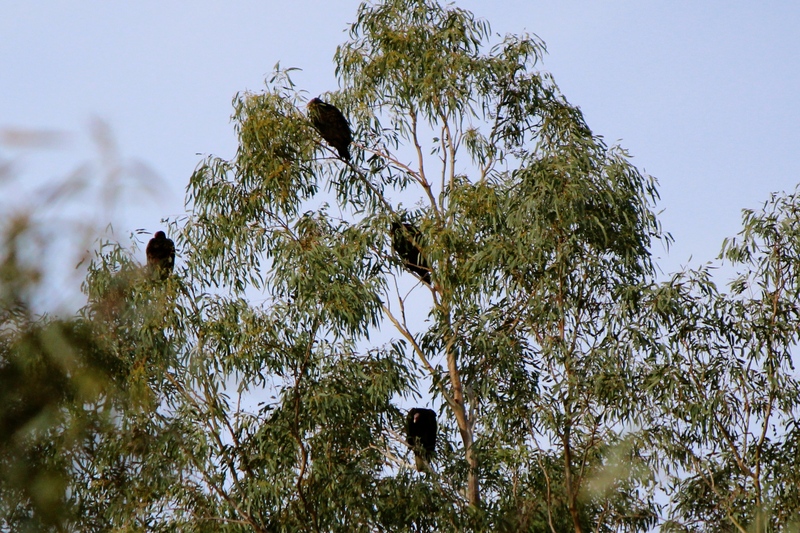 A eucalyptus tree towered above me, and its branches contained roosting turkey vultures. One leaned forward and peered down at me, its head cocked to the side. I lifted my binoculars and counted at least ten birds in the tree, although there could have been a few more. Just beyond the eucalyptus grove, I joined a crowd of about 30 folks who were listening to a presentation by two park naturalists. They told us that the vultures had been back for about a week, and that the birds roosted in the eucalyptus trees at night and then, in the morning, flew across the clearing to the nearby cliffs to warm up before taking off to forage for the day. A few birds had already moved to the cliffs; some sat with their wings spread wide and others hunched close together, perhaps waiting for the sun. Over the next hour or so, one by one the vultures left the roost trees and made their way to the cliffs, and the birds already on the cliffs began stepping off into the air, beating their wings a few times before catching the thermals and lifting high into the Sonoran sky. We decided to hike closer to the cliffs to see if we could get another view of the vultures. “Hiking” with a toddler is kind of a misnomer: we walked a few feet, and then we’d stop so she could play in the dirt. Walk a few more feet then stop so she could pick up a rock. We walked a trail that circled behind the vulture cliffs, along shallow Queen Creek. In addition to stopping for Laurel to investigate interesting sticks and lizards, Jesse and I paused frequently to look at the parks other birds: lesser goldfinches, Gila woodpeckers, a colorful vermilion flycatcher, abundant verdins, a shy hermit thrush, and a spotted towhee singing from the underbrush. We crossed the suspension bridge over the creek and began to hike the “High Trail,” which ascended up the side of a cliff and then turned back to run parallel to the cliffs where the vultures roosted. This steep, rocky, cactus-bordered trail required us to carry Laurel, which she wasn’t happy about but tolerated. Not long after crossing the bridge we heard the musical song of a canyon wren; a silky black phainopepla sang from a willow tree along the creek. Soon, we were across from where the vultures were roosting. It seemed that most were in the process of departing for the day, while a few others still sat with their wings spread. I sat on a bench to watch and two of the sunning vultures suddenly took to the air, soaring and circling high above the creek bed, then directly in front of my bench. I took a few pictures and silently wished them good luck, good health, and good foraging. Keep calm and carrion, friends. In the past 20 years huge declines have been seen in Gyps vulture populations in India and surrounding countries. These declines have been linked to the veterinary use of Dichlofenac, a non-steriodal anti-inflammatory drug. Declines in vultures have had knock on effects like increases in wild dog populations and consequent potential impacts on human health. Dichlofenac seems also to be poisonous to Egyptian vultures. Vulture populations in Africa seem also to be affected by the use of Dichlofenac. Apparent good substitutes for Dichlofenac that do not affect vultures have been identified. Recently, Dicholfenac has become available in Europe for veterinary applications. This threatens vulture populations there, most of which are of conservation concern, all of which are legally protected. Please consider signing the petition below calling for the banning of Dichlofenac in Europe. Assam’s movements during 1-11 March 2014. 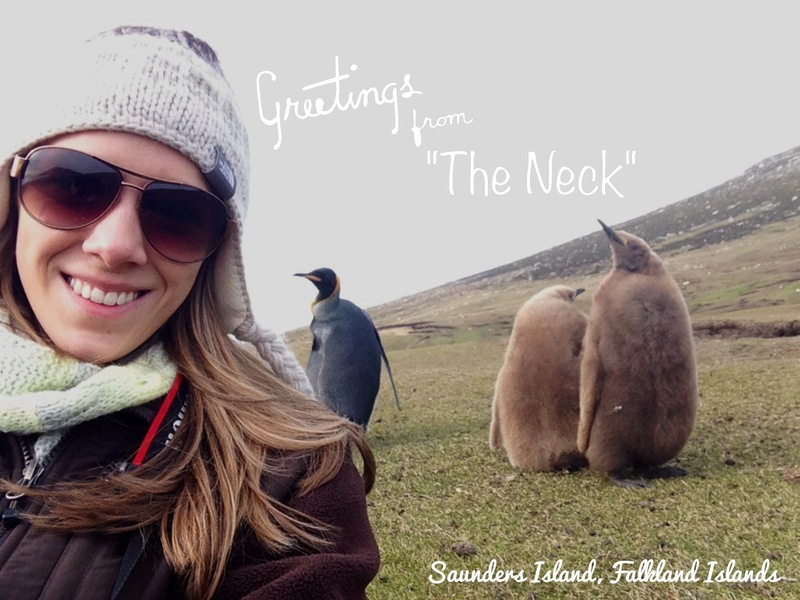 Graduate student Melissa Bobowski at “the Neck,” Saunder’s Island, the Falklands. Yesterday, the Johnny Rooks enjoyed some fame, thanks to a BBC crew who visited the Falkland Islands to film for an upcoming series “Deadly Pole to Pole,” and including footage from our study site on Saunder’s Island. I must say, the Rooks loved every minute being the center of attention. But let me set the stage: During summer most of the Johnnies stay at the “Neck” of Saunders Island, only about 10 miles from the base camp we call the “Settlement,” but still a rugged, one-hour drive by Landrover. The Neck also is home to five species of nesting penguins, including King, Gentoo, Magellanic, Rockhopper and Macaroni, as well as nesting Black-browed Albatross, King Cormorant, and Subantarctic Skua. Combined, the penguins and other water birds provide the Johnny Rooks with an avian buffet both varied and well stocked. 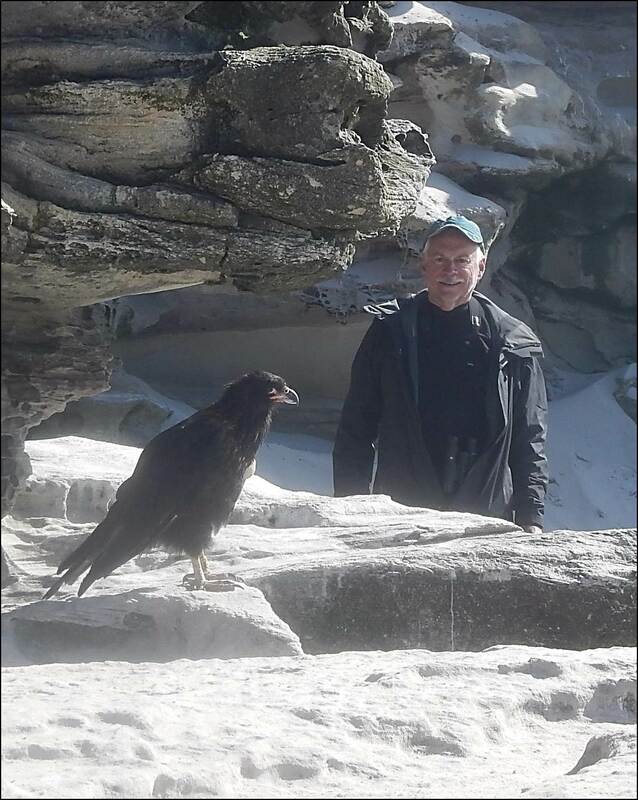 Dr. Keith Bildstein, Hawk Mountain Sanctuary, with a Johnny Rook in the foreground. Keith Bildstein and I traveled to the Neck the day we arrived. It was so good to see our Johnnies again, and as a bonus, I added Magellanic Penguin, Rockhopper Penguin and Black-browed Albatross to my life list. The next day we returned with the film crew, and it was interesting to see the behind-the-scenes work that goes into filming wildlife documentaries. Most important, the Johnnies performed perfectly. We made them work for their 15 minutes of fame by using several food-reward puzzles, or, as documentary host Steve Backshaw referred to them, “deadly experiments” designed to test intelligence. The first was a vertical, two-foot-long piece of clear PVC pipe with four horizontal slats, each with a string tied to one end. We dropped a piece of meat onto the upper-most slat and sat back and watched. If all went according to our plan, the Johnnies would pull on the strings to remove the slats, allowing the piece of meat to fall, slat-to-slat, and drop out the bottom of the pipe. It took five takes for it to work according to plan. The first attempt took 18 minutes and ended with an adult finally realizing, and becoming brave enough, to stick its head into the pipe and pull out the piece of meat. Take two ended much the same manner, except that the same adult solved the puzzle a bit faster. On the third take, we tried to outsmart the birds by placing the meat on second slat from the top and placing a rock next to the pipe so the birds couldn’t reach the second slat’s string. That ended with the meat getting too close to the opening and the bird was able to pull its reward out. Take four was a re-run of take three. A juvenile completed take five by removing most of the slats, including the last one, but he missed out on the food. The scenario reminded me of a child hitting a piñata: the boy or girl who actually breaks it open never gets the most candy. Similarly, the “juvie” was not a happy camper and a lot of screaming and chasing ensued. On take six, all but the last slat was removed fairly quickly, and the birds—having now learned from their experience—stood and waited for another bird to step up and remove the last slat so they could get their reward. Finally, one did, and more chasing and screaming ensued. The second puzzle was a dog toy from Toys-R-Us designed like a circular “lazy-susan” with four flaps on top and eight circles inside to hold treats, or in our case, tiny pieces of mutton. As if that wasn’t enough fun, this toy also spun, allowing access to all eight hiding spots. The only problem I saw was the toy wasn’t transparent like the PVC pipe, but rather was purple and green plastic. After the first try, we decided to leave one flap open so the birds could see the meat inside. Three juveniles showed immediate interest, one of which was dominant and aggressive, just like a high-school bully prepared to show everyone how it’s done, even when he has no idea what he’s doing. A second juvenile quickly learned that in order to get the meat he needed to complete several actions: step on the toy, reach for the flap, reach over the flap from behind and, while still holding it up with one foot, extract the meat. The high-school bully did not like this second “bird-brain,” and made it clear with a great show of tail grabbing, back grabbing and biting. The bully, while able to replicate the actions, sadly opened the flap where a treat had already been snagged.